What is English Bridge Teachers Association? English Bridge Teachers Association (EBTA) promotes and supports effective teaching of bridge. Its aims are to attain the highest standard of bridge teaching across England, professionalise the teaching of bridge; in order to maximise the number of bridge players. 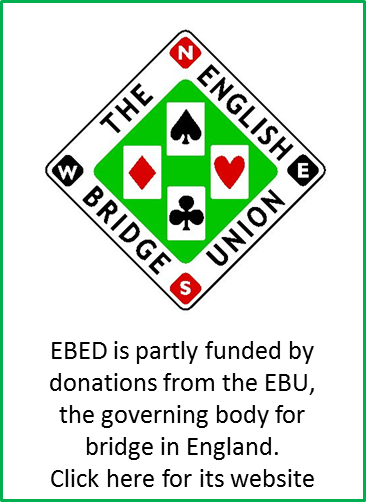 These aims are achieved through EBTA membership and the provision, to its members, of information, advice and training related to all aspects of bridge teaching. year, you can recover your EBTA membership fee. huge amount of support material you can access and use with your students? Membership is open to all, whether you are an established teacher or newly interested in teaching. Initially, you will join as an Associate member, gaining access to the wide range of membership benefits. How much does my EBTA Membership cost? Anyone who is a paid-up member of EBTA is described as an Associate Member. One year’s free Associate Membership is also given following attendance on one of our Club Teacher training courses. Attending this course will give you a strong base to grow your teaching skills plus a structured approach to delivering a Bridge for All program to your students, and means that you will show as "EBED Trained" on our Teachers Directory, giving you a stronger appeal to students finding a teacher through our website. A Full Member of EBTA will have gone through an assessment process, for which there is currently no charge. The assessment includes an observation of your teaching by one of our EBTA Professional Members, a basic test of bridge knowledge and other requirements. Once completed you will be able to use the title, Qualified Bridge Teacher. The detailed procedure for becoming a Full Member is explained here. To become a Professional Member of EBTA, teachers must show satisfactory performance in a number of key areas, amongst which are ongoing support for their students, a commitment to help less experienced bridge teachers and, most importantly, communication skills. The assessment process includes a six-month Personal Development Log, which helps us to assess whether the criteria have been met consistently over a period of time. More details on the process of obtaining Professional Membership can be found here. Teachers who are EBU members should log onto their My EBU Page, and then choose 'Teacher Zone' from the 'utilities' menu. EBTA members who are not EBU members should contact Lisa Miller.